Regardless of how you’ll be celebrating (or not-celebrating) Date Night, women everywhere seem to go on the quest for the ultimate red lipstick. For the budget-conscious, and just a twinge of redness- e.l.f. cosmetic’s $1 Candy Shop lip gloss in Cherry Bomb. Love haunting the drugstore beauty aisles? L’Oreal Colour Juice Stick in Cherry Freeze is a cool-toned red that can go on super sheer, or be layered for a much deeper red. If your V-day plans involve kissing the night away, a lip stain is the only way to go. It’ll last and there’s virtually no transfer. 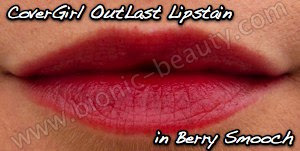 Affordable and accessible suggestions- Cover Girl’s OutLast lip stain marker in Berry Smooch, or Sonia Kashuk’s lip and cheek stain in Sheer Bliss (at Target stores). Top them both with a lip balm or gloss for shine and moisture. Ease of application and superior moisture – Lipstick Queen’s Glossy Pencil in Chinatown Thriller combines lipstick and lip pencil in one. The chunky, stylish black pencil applies like a dream. It’s quite sheer, but can be layered with a few coats for a richer color; and unlike most pencils, it will not dry out your lips! 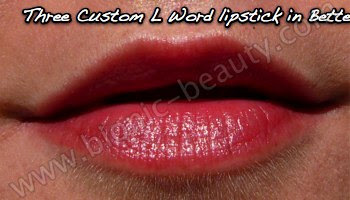 Three Custom Color’s Bette lipstick was named after the powerful and passionate character on TV’s “The L Word”. It has a slightly warm tone: a classic creamy tomato red. Whatever color you choose, remember to take your skin’s undertones into consideration. If you’re a warm toned individual (yellow or olive tones), stick with reds that have a orange or neutral base. For cool skinned women (blue or even rosy undertones), look for berry or blue based reds. However if the lip color is sheer, it’ll usually work for any skin tone! Jami is the editor and founder behind the “Achieve Powerful BeautyTM with the Bionic Beauty blog!” which features beauty advice, cosmetics free samples, product reviews, and women’s issues to help you “Achieve Powerful Beauty!”. Previous Unveil Your Alter Ego with Illamasqua Makeup!